Podcast appearance: A new take on Zero Suicide and Risk Formulation with Tony Pisani, Ph.D.
Joe Higgins from Rocky Mountain MIRECC podcast interviewed me at the American Association for Suicidology annual conference as part of series on Zero Suicide, which includes interviews with Julie Goldstein Grumet, Ph.D. and Brian K. Ahmedani Ph.D. Links below will take you to the interview in whichever player you prefer. Tagged with podcast, suicide, zerosuicide, zero suicide. June 22, 2017 by Anthony Pisani. We are often asked how standardized instruments or interviews like the Columbia Scale (C-SSRS) fit into the risk formulation framework that my colleagues and I developed (Pisani, Murrie, & Silverman, 2015). Tagged with suicide, video, C-SSRS, Columbia Scale, Pisani. March 17, 2016 by Anthony Pisani. December 16, 2015 by Anthony Pisani. A couple of weeks ago, I had the privilege of presenting with Greg Brown and Leah Harris in a Zero Suicide webinar titled, "Screening and Assessment for Suicide in Health Care Settings: A Patient-Centered Approach" The recording of the webinar and slides are now posted on the ZS website. My part of the webinar starts at around 28:00 minutes, but watch the whole thing; my co-presenters are top notch. In my 20-minute portion, I introduced the risk formulation model I've been working on with colleagues Daniel Murrie and Mort Silverman. This model is the centerpiece of Commitment to Living and is also incorporated in the most recent revision of the Suicide Prevention Resource Center's flagship workshop, Assessing and Managing Suicide Risk: Core Competencies for Mental Health Professionals. November 10, 2014 by Anthony Pisani. I'll be speaking in Lewiston Idaho next week at the St. Joseph's Region Medical Center's annual Rural Mental Health Symposium. I know from IP addresses that we have readers in the Northwest. If any are in the Lewiston area, please come. Posted in career/life of author, current events and tagged with Lewiston, Suicide prevention, Idaho. Is post-diagnosis suicide risk in cancer patients related to psychological or physical factors? I have been thinking and learning a lot about suicide risk in cancer patients because I am working with some colleagues in cancer control and prevention to identify and respond to educational needs among cancer care professionals. Related to this topic, readers might be interested a nice article by Kendal & Kendal published last year in the journal Crisis (abstract linked below). This article titled, Comparative Risk Factors for Accidental and Suicidal Death in Cancer Patients makes a number of insightful observations about risk in cancer patients based on statistical analyses of a large and impressive NCI dataset (SEER, 1973-2000). Among the observations I found most interesting was that the well-documented increased risk of suicide in the year following cancer diagnosis, which is commonly attributed to psychological factors, may in fact be more closely related to physical factors, i.e. rapid deterioration of symptoms in rapidly progressing disease. Because many of the candidate psychological factors were not measured in this study, the question cannot be studied directly, but I found the findings compelling enough–and their treatment in the article careful enough–to warrant consideration. In the end, it may be very difficult to tease apart psychological distress from physical suffering, but I appreciate this article drawing attention to the question. Citation: Kendal WS & Kendal WM (2012). Comparative risk factors for accidental and suicidal death in cancer patients. Crisis: The Journal of Crisis Intervention and Suicide Prevention. 33(6):325-34. doi: 10.1027/0227-5910/a000149. Posted in primary care, risk assessment, research, needs development and tagged with cancer, suicide prevention. June 10, 2013 by Anthony Pisani. My colleagues and I conducted a study examining associations between self-reported suicide attempts, emotion regulation difficulties, and trusted youth–adult relationships among 7,978 high-school students. 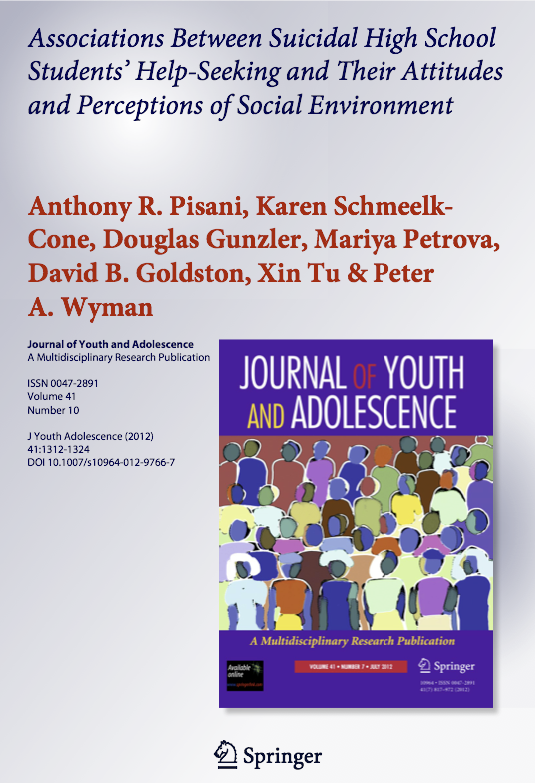 The results have been pre-published online in the Journal of Youth and Adolescence. Our findings point to adolescent emotion regulation and relationships with trusted adults as complementary targets for suicide prevention that merit further intervention studies. We argue that reaching these targets in a broad population of adolescents will require new delivery systems and “option rich” (OR) intervention designs. Print publication will follow later this year. Posted in career/life of author, research and tagged with youth suicide, suicide prevention, suicide, emotion regulation. February 25, 2013 by Anthony Pisani. Assessments are human encounters, a chance to demonstrate compassion and instill hope. A small qualitative study by colleagues in Manchester, England illustrates the importance of caring assessments and of considering the social and family context of the individual in planning. Hunter et al conducted 13 initial interviews and 7 follow-up interviews with individuals who had been hospitalized related to some form of self-injurious behavior. Their findings are highly congruent with the hallmarks of patient and family-centered response to suicide risk that I have proposed. The article (linked below) outlines a number of lessons about what matters to patients, which boils down to having meaningful interactions with clinicians who: convey empathy, understand problems from their perspective, inspire hope, and develop plans/referrals that match their preferences and social context. None of this is rocket science; it's harder than that. Hearing how much it matters to patients should encourage all of us with a commitment to living to continually refine our approach to assessment. Posted in clinical interview, treatment planning, risk assessment, research, PFCC and tagged with patient and family-centered care, patient-centered care. September 3, 2012 by Anthony Pisani. Apropos of my post on needing more family-centered work, I came across this study out of Taiwan just published in Nurse Education Today: A suicide education programme for nurses to educate the family caregivers of suicidal individuals: A longitudinal study. It is good to see this kind of work being done, and refreshing to see people trying to test their work with controlled designs. I'm not sure I agree with how all of the concepts are laid out (and I really don't like the heavy-handed first line of the abstract: "Family members lack the ability to care for suicidal relatives"), but this is a helpful example of the kind of attention to families that is needed. Posted in family, PFCC, needed contributions and tagged with patient-centered care, family-centered care, nursing, suicide. August 17, 2012 by Anthony Pisani.